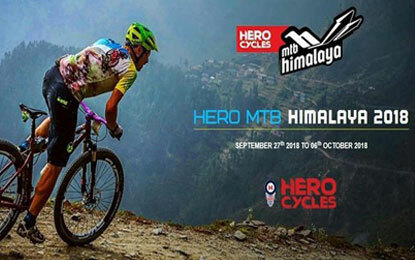 The 14th edition of Hero MTB Himalaya biking race featuring 72 riders from 15 nations will be flagged off from Shimla on September 27th. The race is scheduled to reach its destination on October 6th. The annual cross-country multi-stage mountain biking race will be organised by the Himalayan Adventure Sports and Tourism Promotion Association (HASTPA), Himachal Tourism and Hero Cycles. The biking race which covers eighth-stage route is entitled as the toughest one in Asia. The organisers HASTPA, has prepared the race track with tarmac, broken gravel, rocks, mud and sand. In the race, the riders will cover a distance of 650 km, 60-90 km every day, and scale three passes-Rupin,Indradhar & Shatadhar( the highest point at a height of 3100 meters). They will also cross Himachal Pradesh’s four districts –Shimla, Kullu, Mandi and Kangra including two freezing rivers- the Beas and the Sutlej. The riders will also cross through the boundaries of the Great Himalayan National Park which happens to be one of the largest parks in India and UNESCO designated world heritage site in Kullu. In the last leg, the riders will visit Dharamshala. “We have confirmed the participation of 72 cyclists from India, Portugal, Germany, South Africa and Spain, New Zealand, England, Norway, Nepal and Bangladesh,” said Mohit Sood, HASTPA president.